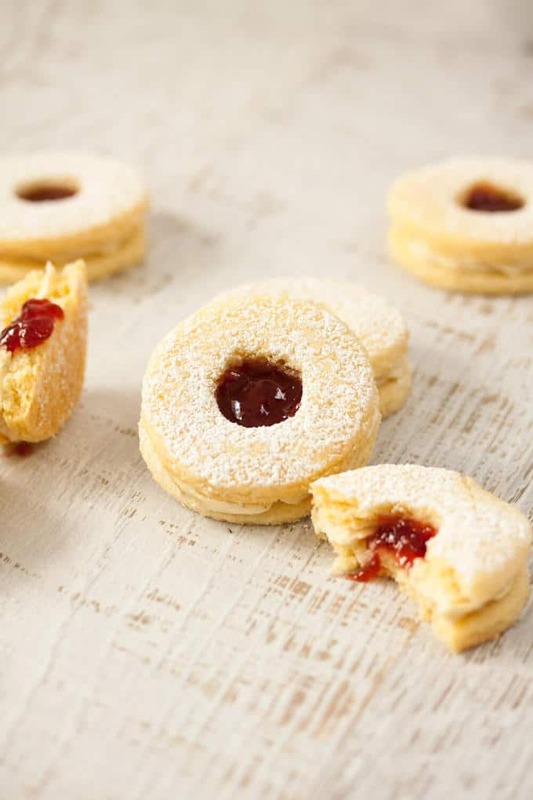 Sweet, summery coconut cookies, with a jam centre and all made in the food processor. So easy! As a food blogger, I cook a lot. A LOT! A lot of cooking generally equals a lot of washing up. I’m used to it so it’s ok, plus hubby is a real sweetie and will often offer to do the washing up for me. I know, right ?. Lucky ain’t the word! But baking and washing up can be time-consuming so, often, I just want a quick recipe so that I can get other blog tasks done. You know, writing up recipes and posts, editing photos and learning new stuff. Well this one day, I had planned to do no baking at all. None. I already had a number of recipes ready to post, they just needed a post written out so it kind of gave me a leave pass to focus on things other than cooking. So, we spent a nice morning, going out for breakfast (one of our favourite things to do) and doing the grocery shopping together which we really enjoy. Sad but true ?. I was excited at the prospect of getting home and having all day to do those other blog things that I never get to do. Then, we’re driving home, sun shining, chatting away about our upcoming wedding anniversary and cookies popped into my head. And coconut. Maybe I’ll just do one teensy, weensy, little, baby, quick bake of coconut cookies. Totally doable! Hubby rolled his eyes, quite understandably. The dialogue went a little like this. Me “Yeah, but if I just make it a quick recipe ….”. He thinks I’m a little over-ambitious with what I try to fit in to the time I’ve got. I think he’s wrong. Every time. Even after he’s been proven right. Every time. I adapted my Iced Sprinkles Sugar Cookies recipe for this one. Not sure why coconut cookies came to mind. I guess I thought cookies are quick and with the sun shining it felt summery and coconut goes with Summer. Then I added a bit of jam for a truly delicious flavour combo. And yes, the food processor worked just perfectly. Fist-pump and boo-yeah! I even went the whole hog and made buttercream in the food processor. I didn’t even wash it out in between. You heard – R.E.B.E.L. That’s me. You literally just throw ingredients into the food processor, process them, roll out the dough, cut into circles, bake, throw buttercream ingredients in the food processor, process for 3 minutes then pipe onto the cookies. Phew! Oh, and add the jam. Easiest cookie EVER and only one bowl to wash up. Winning!!! And they taste amazing too. Sweet and summery. I love the hit of jam in the middle. This is the first time I’d ever tried to make buttercream in the food processor but it definitely won’t be the last. The texture was great and was perfect for piping into the coconut cookies. Gotta love little wins like this. Get baking and enjoy ? 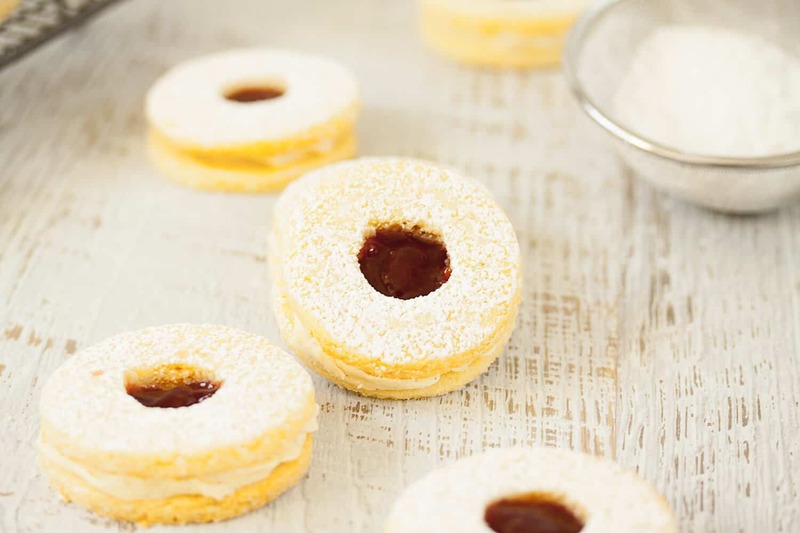 Sweet, summery coconut cookies, with a jam centre and all made in the food processor. Preheat the oven to 180C / 350F (160C fan forced). Line 2 baking trays with baking paper. Tip the coconut into the food processor, and process on high for around 20 seconds just to make it a little finer. Add the flour, baking powder and sugar and process to combine. Add the cold butter and process again for another 20 – 30 seconds until it is finely chopped through the flour mixture. It will still be a little lumpy and that’s ok. Finally, add the egg, vanilla and cold milk. Process again for about 30-40 seconds until everything well combine and the dough starts clumping together. Tip the mix out onto a clean surface and pull together with your hands, kneading lightly until it starts to stay together – only a minute or so. Lay out a long sheet of baking paper (about 70cm) and lay the dough in the centre of one half of it. Fold the other half over the top and use a rolling pin to roll the dough out to about 3-4mm thick. 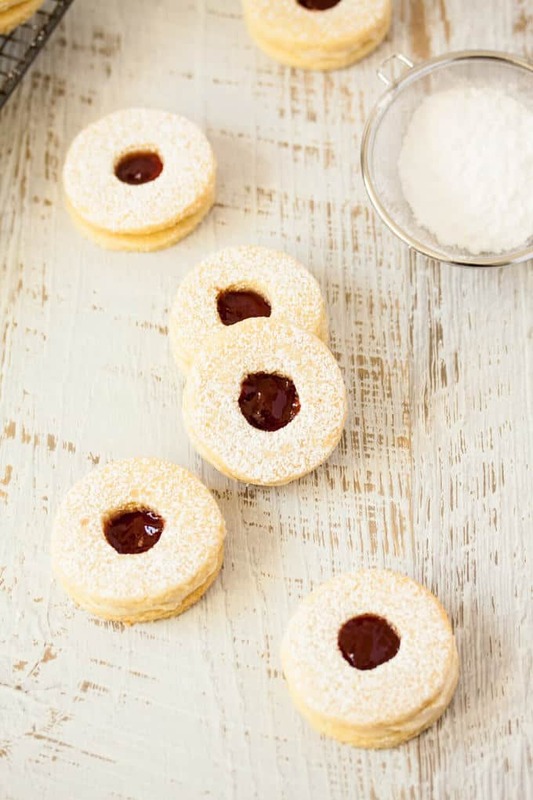 Use a 2 inch circle cutter to cut as many cookies as you can, then use a 2cm cookie cutter to cut a hole out of the centre half of them (so if you cut 12 circles, cut a hole in the centre of 6 of them). Use an offset spatula to gently place them on a baking tray about 1 inch apart. Reroll the dough and repeat until it has all been used. Bake in the oven for 4 minutes, turn the trays, bake for another 4-5 minutes until just starting to turn golden on the edges. Use an offset spatula to help transfer them carefully to a cooling rack and allow to cool completely (see notes). Now dump the filling ingredients (except the jam and extra icing sugar), into the food processor, sugar first. Process the whole lot for about 3 minutes on the low setting. Transfer the buttercream to a piping bag. Either pipe or spread the buttercream over each base cookie (the ones without the holes in the middle), leaving the centre empty. Place the lid on top and gently press down. Sift the extra icing sugar over the top. Now pipe the jam into the centre of each one. Once the cookies come out of the oven, you’ll notice the holes are a little smaller than they started out due to a little spread during cooking. 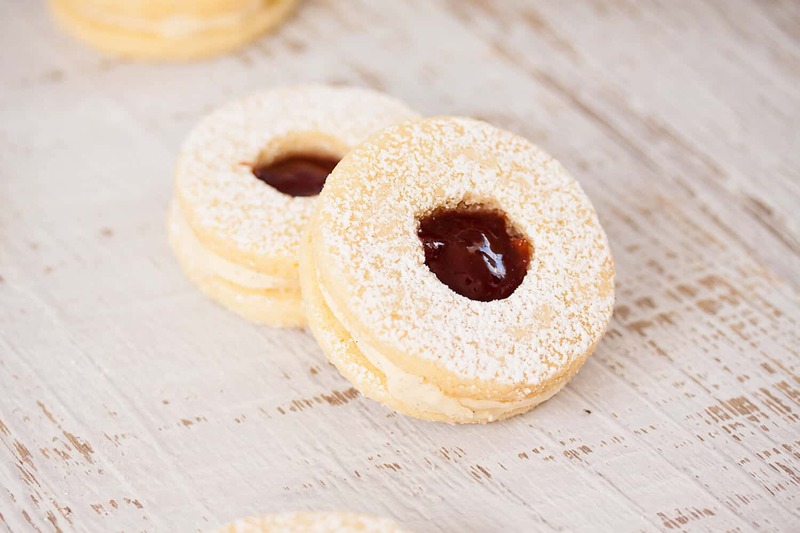 If you want to make a larger hole again, then, while the cookies are still warm, use the same cookie cutter you used to cut the centre hole again. It will be tricky if you leave it until they cool.